Tag Archives for " Flash Briefings "
Ross Brand with your Livestream Universe Update and Flash Briefing for Tuesday, August 28th, 2018. The Ladies Go Live 5-day lifestream challenge is this week and it’s not too late to join. Lottie Hearn, Jenn Nelson, Tina K. VaLant and the Ladies Go Live community help you get started and overcome any fears. You can also win prizes ranging from $50 to $2000 dollars in value. More information on the Ladies Go Live Facebook page. Yesterday’s hardest working person in live streaming honors goes to Phil Gerbyshak. He hosted 3 separate full lifestream interview shows. Of particular interest to content creators, marketers and business owners is his interview with Tom Webster, the Senior Vice President of Edison Research. Tom discussed what you need to know about how your business sounds — and why you should care. All 3 shows are available on the Phil Gerbyshak Facebook page. 2pm ET — It’s The Bot Signal with RJ Redden. That’s on the Black Belt Bots Facebook page. 4pm ET – Jessika Phillips and Mike Gingerich host Training Tuesdays. They’ll be talking about the Americans with Disabilities Act and what you should be prepared for. View on the Magnet Marketers Facebook page. For LivestreamUniverse.com, I’m Ross Brand. Have a great day! Ross Brand with your Livestream Universe Update for Thursday, August 23rd, 2018. If you livestream sports or other types of events — or are interested in doing so, you’ll want to check out Wirecast Live today at 5:30pm ET. Andrew Haley interviews Fantag creator Brian Dombrowski. 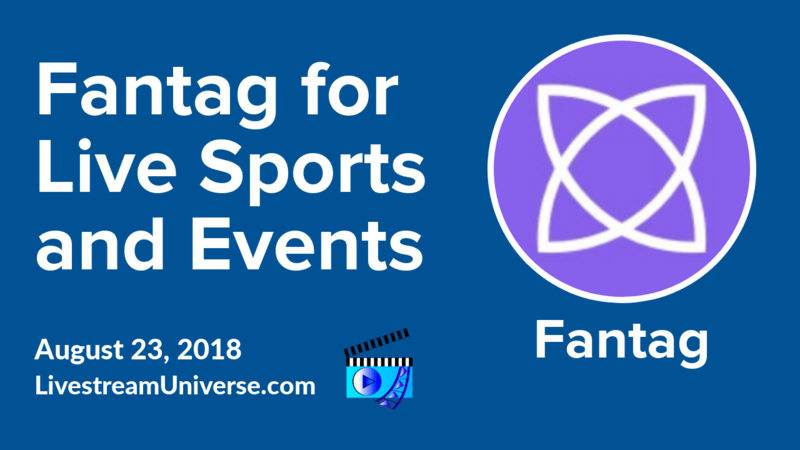 They’ll explore how media departments, schools, and communities can use Fantag to manage all their video in one place. Watch on the Telestream Wirecast Facebook page. And if you’re interested in a free trial of Wirecast, head over to http://LivestreamUniverse.com/resources. At 2pm ET, it’s The Bot Signal with RJ Redden. She’ll be talking about Bots for Online Events including livestreams, webinars, and workshops. View on the Black Belt Bots Facebook page. At 3pm ET, Eddie Garrison hosts EG Live. Today’s topic is user generated content. That’s on the Eddie Garrison Social Facebook page. At 9pm ET — It’s Home Gadget Geeks with Jim Collison. He’ll be discussing Car Diagnostics Tools. View at TheAverageGuy.tv/live. For http://LivestreamUniverse.com, I’m Ross Brand. Have a great day! Ross Brand with your Livestream Universe Update for Wednesday, August 22nd, 2018. At 5pm ET — It’s BradsLive. 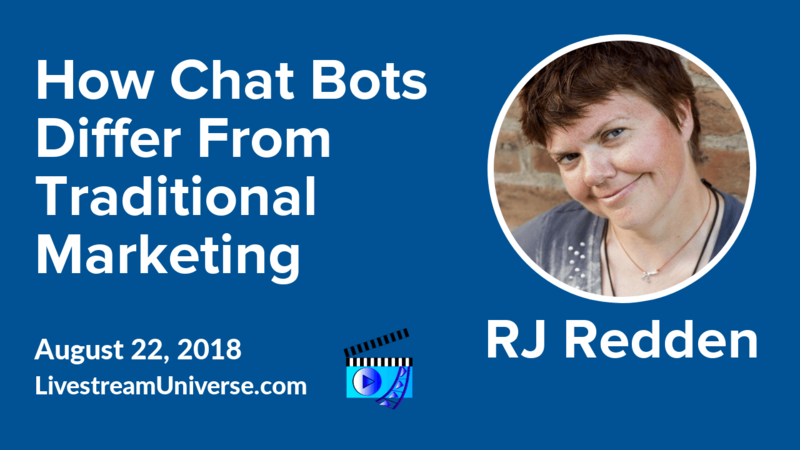 RJ Redden joins Brad Friedman to talk about how chat-bots are different from traditional marketing. View on The Friedman Group Facebook page. For LivestreamUniverse.com, I’m Ross Brand. Have a day! Ross Brand with your Livestream Universe Update and Flash Briefing for Tuesday, August 21st, 2018. If you want to sell your own products and services online, it’s often best if customers can make the purchase right on your website. PayPal remains a leading option for taking online payments. 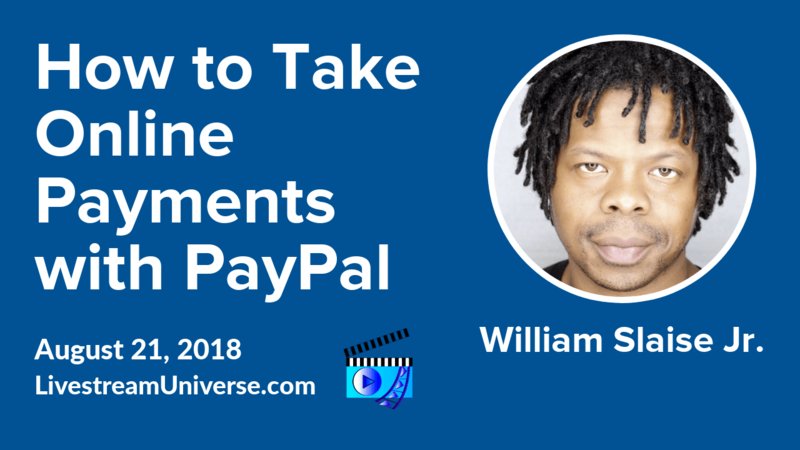 In a recent livestream, William Slaise Jr shows you how to Create A PayPal Link To Allow Your Customers To Pay You For Your Services/Products. View it on his personal Facebook profile at facebook.com/WilliamSlaiseJR. 2pm ET — It’s The Bot Signal with RJ Redden. She’ll be discussing Bots for Live Events. View on the Black Belt Bots Facebook page. At 3pm ET – The topic on The JennyQ Show is how to craft your message to attract clients. Jennifer Quinn welcomes Maya Elious. That’s on the JennyQ Facebook page. 4pm ET – Jessika Phillips and Mike Gingerich host Training Tuesday on the Magnet Marketers Facebook page. They’ll be talking about Facebook’s New Biz pages and locations roll out. Ross Brand with your Livestream Universe Update and Flash Briefing for Monday, August 20th, 2018. One of the most popular questions asked in live streaming and podcast groups is what microphone should i get. On the latest episode of the LivestreamDeals podcast, we talk with Michelle Miller Levitt, voice-over artist and Marketing Director at Heil Sound. 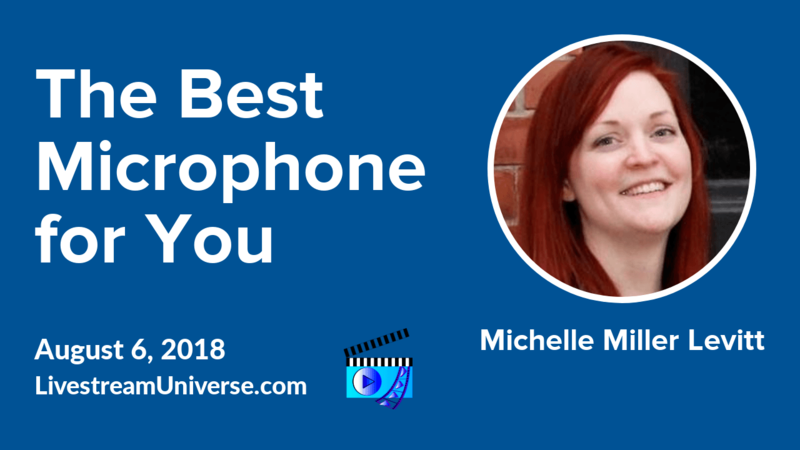 She talks about the kinds of microphones that work best for broadcasting and how to choose the right mic for you. You can hear the full interview at LivestreamDeals.com/Ep8. And a must see replay to tell you about: Jason Franco shared his video production knowledge on Nerdy Girls Geek Out. That’s a must see new show hosted by RJ Redden and Kim Bultsma. Catch the replay on the Nerdy Girls Geek Out Facebook page. 3pm ET — It’s BeLive Weekly with Owen Video. Aaron Montgomery joins Owen as they share 7 steps to doubling or tripling your audience. View on the BeLive Tv Facebook page. Ross Brand with your Livestream Universe Update and Flash Briefing for Tuesday, August 7th, 2018. One way to generate more interest in livestream shows is by promoting them through social media posts. The effectiveness of that social media outreach can depend greatly on how the posts are constructed. If you are struggling to gain traction for your social posts, Laura Petersen of Copy that Pops says there is one major change that can greatly boost engagement. 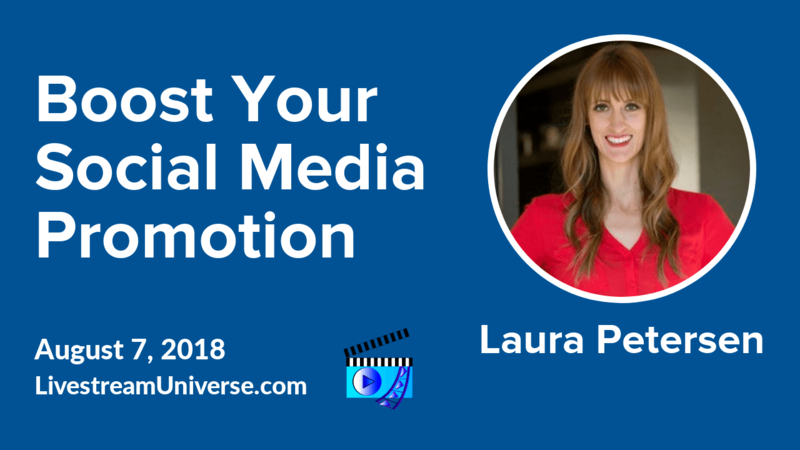 Laura is the best-selling author of Permission to Write a Brand-Building Book for Podcasters. 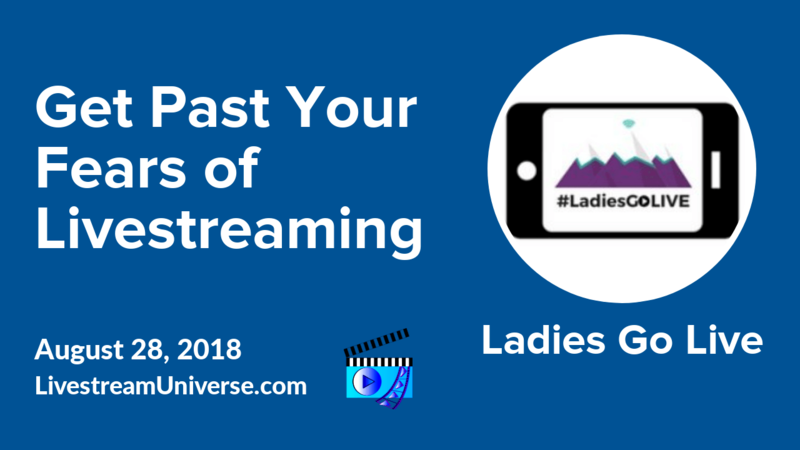 She was a recent guest on LivestreamDeals and shared how she added mystery to her podcast promotion. More information about Permission to Write a Brand Building Book for Podcasters at LivestreamDeals.com. The lessons in that book apply equally well to livestreamers, content creators and entrepreneurs. You can watch the full interview with Laura on our brand new LivestreamDeals Facebook page: Facebook.com/LivestreamDeals. Our deal of the day is for anyone wanting to successfully launch or grow a podcast. It’s 20 percent off on a monthly subscription to the School of Podcasting. Learn how to podcast from Hall of Fame podcaster Dave Jackson. More info at LivestreamDeals.com/courses. At 2pm ET, RJ Redden hosts The Bot Signal on the Black Belt Bots Facebook page. Jessica Payne joins RJ to talk about storytelling with bots. At 3pm ET, it’s EG Live hosted by Eddie Garrison. His topic today is how to utilize your competition. Eddie has moved his livestreams from his personal profile to his Eddie Garrison Facebook business page. 4pm ET, it’s Magnet Marketers with Jessika Phillips and Mike Gingerich. They’ll be discussing 11 huge Google Ad shifts to note now. That’s on the Magnet Marketers Facebook Page. And at 5pm ET, It’s the Hollywood Spotlight Series hosted by Hollywood Insider Joie Gharrity. She’ll be featuring the cast of Lyman the Musical. It’s the first time the cast has appeared together on a live show. View on the Hollywood Spotlight Series Facebook page. Show & event links at our website. For LivestreamUniverse.com, I’m Ross Brand. Have a day! Ross Brand with your Livestream Universe Update and Flash Briefing for Monday, August 6th, 2018. Choosing a microphone for live streaming and podcasting is a more personal choice than most people realize. Reviews and price points won’t indicate whether that mic will actually sound good with your particular voice. 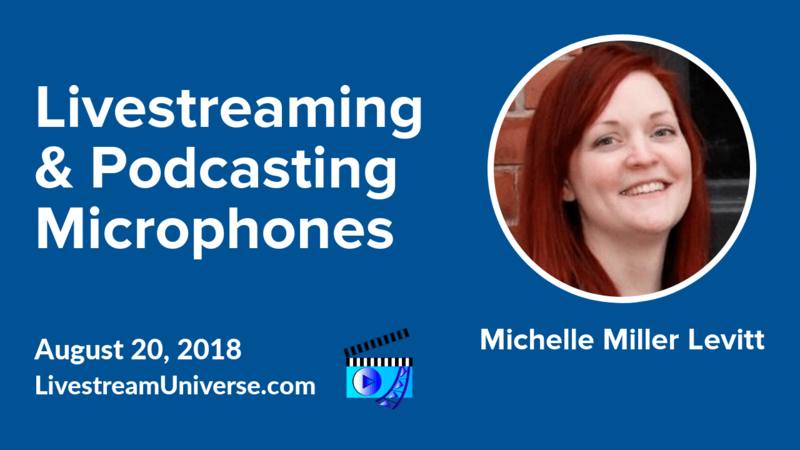 Michelle Miller Levitt of Heil Sound was a recent guest on Livestream Deals. She offered her recommendation for how to pick the best mic for you. More info on Heil microphones at LivestreamDeals.com. You can watch the full interview with Michelle on our brand new LivestreamDeals Facebook page: Facebook.com/LivestreamDeals. Our deal of the day features a USB microphone that’s a great choice for new live streamers and those looking for a solution in the double digit price range. The Samson Q2u is the dynamic USB microphone I used for over two years and is available now on Amazon for just $54.99. Find it at LivestreamDeals.com/gear. At 2pm ET, Phil Gerbyshak chats about leadership with acclaimed TED Talk speaker Drew Dudley of Day One Leadership. View on the Phil Gerbyshak Facebook page. And check out the replay of Professor Nez talking content marketing strategy. Nez shares 4 psychological insights from LinkedIn to boost your content. View at YouTube.com/ProfessorNez. Ross Brand with your Livestream Universe Update and Flash Briefing for Thursday, August 2nd, 2018. Snack-able audio content is growing in popularity on smart devices, but the setup and distribution process can seem daunting for creators. trebble.fm has a solution to make it easy to record or upload 90 second audio clips that are then available on smart speakers from Amazon and Google Home. The startup is invite only at this point. 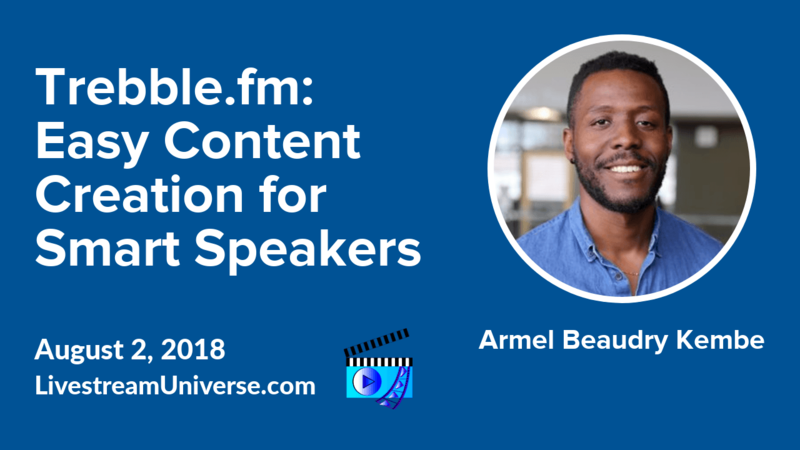 Learn more about trebble.fm at 7pm ET tonight as founder Armel Beaudry Kembe joins us for #LivestreamDeals. Chris Curran from Podcast Engineering School who has a new program starting in September. It’s the only school in existence that teaches the professional audio engineering aspects of podcast production at the highest level. 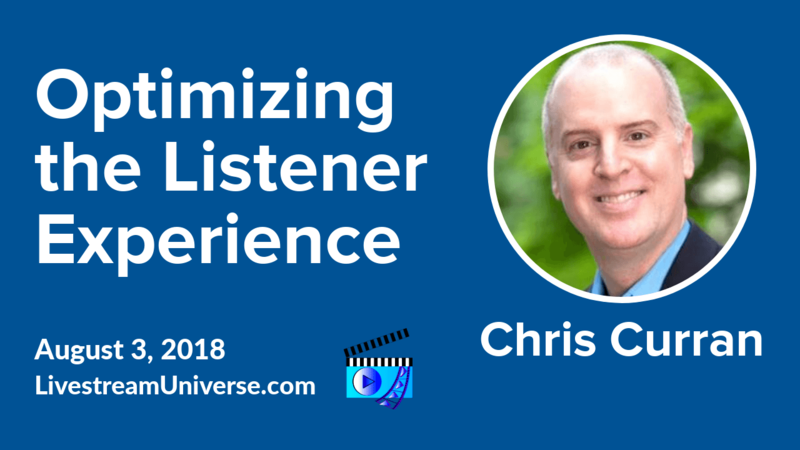 Chris produces podcasts for large companies. Michelle Levitt from Heil Sound, makers of the Heil PR40 microphones popular among podcasters such as Leo Laporte and Pat Flynn. You can spot PR40s on livestreams by Todd.Live, Kim Doyal, Brad Friedman, Madalyn Sklar and many others. Thanks to Heil for providing the mics and headphone for our live podcasts from Podcast Movement. And Laura Petersen, best-selling author and podcaster. Her newest book is “Permission to Write a Brand Building Book for Podcasters.” Her advice is equally applicable for live streamers and content creators of all stripes, solopreneurs, speakers — you get the picture. Join us at 7pm ET for LivestreamDeals at RossBrand.Live. BeLive.tv has added four brand ambassadors. Congrats to Jennifer Quinn, Tiffany Lee Bymaster, Kary Oberbrunner and Fallon Zoe on their new roles with BeLive. 2pm ET – RJ Redden hosts The Bot Signal on The Black Belt Bots Facebook Page. 3pm ET – it’s Live Positive with Jeff Adams on the BeLive.tv Facebook page. Kaye A Peters joins Jeff to talk about overcoming excuses keeping you from pursuing your dreams. 9pm ET – Jim Collison hosts Home Gadget Geeks. View at theaverageguy.tv/live. And a reminder to join us for Livestream Deals at 7pm ET on the Livestream Universe Facebook page. RossBrand.Live takes you there! Ross Brand with your Livestream Universe Update and Flash Briefing for Tuesday, July 24th, 2018. 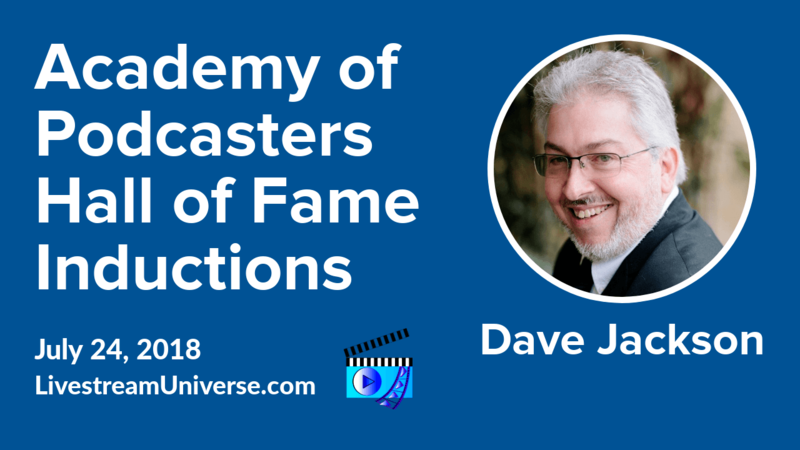 Dave Jackson from the School of Podcasting is one of eight inductees entering the Academy of Podcasters Hall of Fame. The ceremony at 7:30pm ET tonight in Philadelphia is a highlight of Day One of Podcast Movement. Other inductees include Chemda and Keith Malley from “Keith and the Girl,” Father Roderick VonHogen from The Daily Breakfast, Grant Bociocco from The Radio Adventures of Dr. Floyd, Pamela Gay from Astronomy Cast, Reggie aka Combat Jack from The Loud Speakers Podcast Network & The Combat Jack Show and Scott Johnson from Frog-pants Studios. 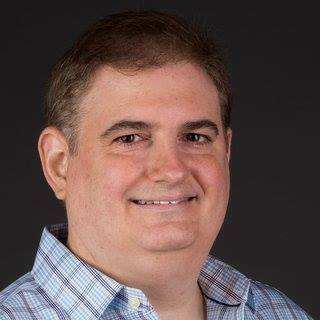 Dave Jackson was a recent guest on LivestreamDeals. He says keeping his speech to five minutes is the biggest challenge. I asked Dave which of his many podcasts has had the biggest impact. In addition to the Hall of Fame ceremony and speech tonight, Dave has a full schedule at Podcast Movement. Daniel J. Lewis from The Audacity to Podcast will be inducting Dave into the Hall of Fame. More info on tonight’s ceremony and the inductees at AcademyofPodcasters.com. 3pm ET – Eddie Garrison host EG Live on his personal Facebook profile. 4pm ET – It’s Magnet Marketers with Jessika Phillips and Mike Gingerich on the Magnet Marketers Facebook page. 8pm ET – It’s the Best of BeLive with Ross & Rachel. Mike Allton from AgoraPulse joins us to talk about the role of live streaming in influencer marketing. That’s on the BeLive.tv Facebook page.